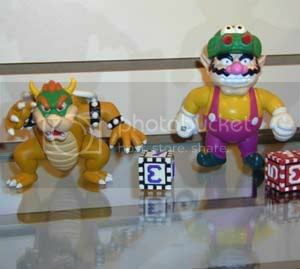 As much as Wario merchandise is cool, I wouldn't recommend buying anything fan made. It gives people the (somewhat mistaken) impression that it's okay to sell fan art and works, despite none of the money going to the original company or creators. It also gives the impression that stuff on Etsy and similar sites is more legitimate than fan fiction, fan games or fan movies, all of which would be seen as somewhat dodgy to be selling. I'd rather give money to a fan who's probably a broke student or an artist that could use the support than a cash-cow company, to be honest. Not taking jabs at Nintendo but if fans are the only place I'd be able to get merch for specific IPs from, I wouldn't lose any sleep over them not getting my cash. Personally, it's not so much not giving Nintendo cash but showing support and demand for something, even if it's in a small way. Makes me wish I could draw, though. Id make my own Mona poster if I had the ability : / Its too bad Nintendo wont make one for me. I still don't consider it too ethically right. Even less so when you consider the obvious double standards here, where apparently fan art and fan merchandise can be sold but other fan works will get shut down if money is even considered. I like to think the average fan game (especially the Wario Land and WarioWare ones) have more value than the average Wario Land or WarioWare poster. 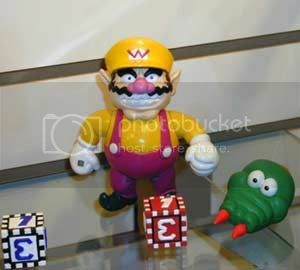 Wait, the Dragon Cap was included with a Wario action figure? That's pretty cool! There's apparently a Made in Wario Gorgeous poster in Japan. I'd definitely categorise that as merchandise. Not full Wario merch per se, but he appears in a Japanese music composition book of which I cannot even remember what game it was based on. And now here are the Wario stickers in the flesh.